BEIRUT (CNS) — Syrian children who have seen their houses bombed and family members killed are using string, glue, socks, beads and other odds and ends to help put their lives back together. Counselors, teachers and volunteers are being trained to help the children process their trauma through the use of puppets. In some instances, children who had not spoken in months would speak to the puppets, said Davide Bernocchi, country representative to Lebanon and Jordan for Catholic Relief Services. Staff members of the U.S. bishops’ international relief and development agency CRS have worked with No Strings International to create films using puppets. They trained adults how to use puppets to talk to the children about what they saw. The children then make their own puppets. Zgheib said that in working with hundreds of children, the trained adults, or animators, have found that especially the 11- and 12-year-old girls felt like they had to become adults and take care of their siblings. The puppets allowed them “to play … to sing and to dance,” she said. Lana Snobar, counseling coordinator for Caritas in Jordan, said the Syrian refugee children are “used to bombs” and to “seeing blood on the street.” Often the children — who sleep with their entire families in small, partitioned areas of church basements and schools — suffer from bedwetting. Robin Contino, CRS technical adviser for psycho-social support, is a licensed clinical social worker who spent 15 years overseas, mostly in Asia. “We know that kids process trauma not through talk, but through play,” she said. Many children who have experienced trauma have post-traumatic stress disorder, she added, explaining that they might find it hard to sleep or jump when they hear noises. “It’s the norm, but it never gets normal,” she said. Once CRS identifies an area with a need, the No Strings International crew visits the affected area so the puppets look like local residents. No Strings creators use rhythms and instruments from that region to create a score for a film. An emergency film often takes five months from conceptualization to post-production. “The (movie) puppets are the real deal,” Contino added. Several people who work for No Strings International have worked for “The Muppets” and “Fraggle Rock,” she said. The animators do not ask the children what they think of the film, but use the puppets to talk about the film and draw children into the conversation, she said. “One of the key messages of our film is validating emotions,” Continuo said: Fear, withdrawal, anger are all OK.
“Red Top, Blue Top” has a theme of peacebuilding. Puppets — wearing either red or blue hats — represent different communities that have lived together for a long time and are critical of each other’s traditions. Each community has elders. When a wise man sees the elders plotting against each other, he switches their shoes, and when the elders put on each other’s shoes, they see things through the eyes of the other. In “Out of the Shadows,” a brother and sister who lost their parents are taken in by a loving aunt. When the dinner candles cast shadows on the wall, the young girl reacts in terror because it reminds her of the violence she has witnessed. This upsets her brother, who becomes very protective. When a local shadow puppeteer comes to town, the brother destroys his stage and puppets, so the shadows do not scare his sister. The wise puppeteer involves the brother in helping him rebuild and work the puppets, which eventually allows him and his sister to process their trauma. “There’s messages of ‘That power’s within you,'” Contino said, adding that 90 percent of trauma victims heal by connecting with others. 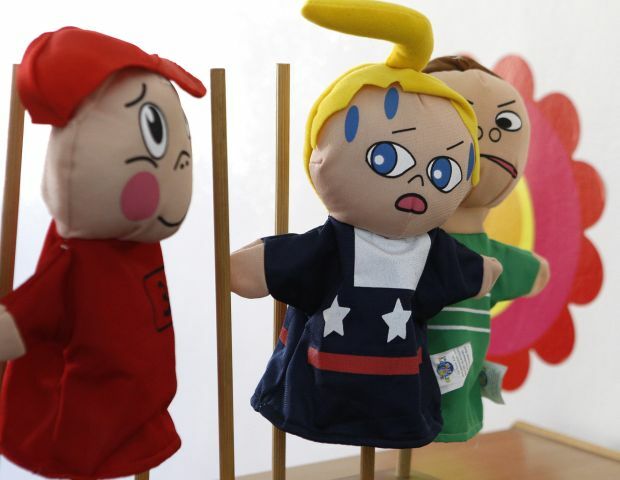 In Beirut, Zgheib said refugee children use the puppets to talk about sexual abuse or what they saw in Syria. 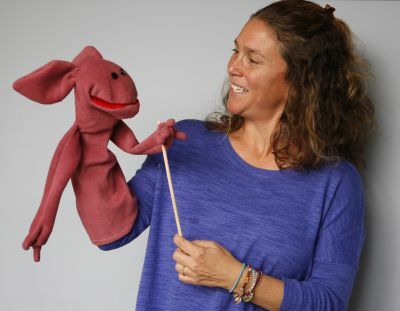 “It was very important for them to express (themselves) through the puppets,” she said.